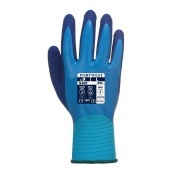 The Armalite General Handling Nitrile Coated Gloves AV728 are standard quality, medium weight blue Nitrile coated gloves on a jersey cotton lining with a comfortable knitted wrist. The Armalite General Handling Nitrile Coated Gloves AV728 offer resistance to cuts and abrasion with good resistance to oils and greases. 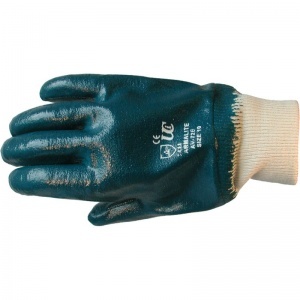 The "Sanitized" hygiene function of the Armalite General Handling Nitrile Coated Gloves AV728 brings increased freshness, comfort and protection. 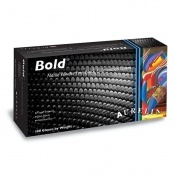 The product code for these gloves is AV728. 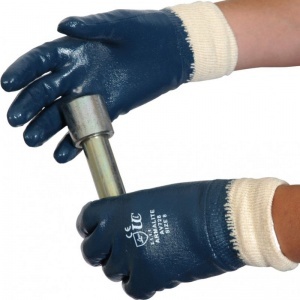 The Armalite General Handling Nitrile Coated Gloves AV728 have been sized according to EN 420, which governs a range of features about gloves including standardised sizing. Please measure the circumference and length of your hand and see below for the size of glove that is necessary. Four sizes of these gloves are available. They are ok for the price but I want a heavier duty version, I will go back and look on the web site. The order was delivered exceptionally quickly despite the busy period. Well done!